Shangri-La will makes its long-awaited debut at The Shard in London this May. 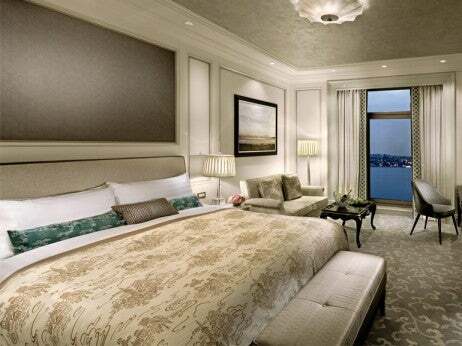 The Shangri-La Hotel will open this May at The Shard in London. Located on the historic South Bank of the River Thames in the 306-meter-high (1,004-foot-high), the hotel will be the Hong Kong-based luxury hotel group’s third in Europe, following debuts in Paris in 2010 and Istanbul in 2013. As the tallest hotel in Western Europe and the first high-rise hotel in London, the Shangri-La occupies levels 34 to 52 of the 72-story Shard. Its contemporary interior design complements Renzo Piano’s masterful architecture and the breathtaking views – unmatched by any other hotel in London – unfold in all directions revealing iconic landmarks such as St. Paul’s Cathedral, Tower Bridge and the Houses of Parliament. Every detail of the hotel environment has been taken into consideration – from the extensive collection of original artworks on display to the spectacular grand staircase sweeping across double length floor-to-ceiling windows, linking levels 34 and 35 within the hotel’s sky lobby. Guests will be escorted in a high-speed elevator from the hotel’s dedicated entrance on St. Thomas Street to the sky lobby on level 35. Subtle Asian touches in the lobby and lobby lounge will reflect Shangri-La’s heritage, while modern and classic art with pieces from a mix of acclaimed Asian and British artists are showcased throughout public areas. The hotel’s 202 guestrooms and suites will open from levels 36 to 50 and are amongst the largest in London. Because of The Shard’s spiral shape, each of the spacious guestrooms and suites, which range from 30 to 188 square meters (323 to 2024 square feet), is individual in layout and design. All feature floor-to-ceiling windows and unrivalled views across the city, marble-clad bathrooms with heated floors, separate bathtubs, Acqua di Parma amenities and mirrors with integrated television screens. Over a third of these bathrooms have city views. Deluxe, Premier and Grand Premier guestrooms and suites offer northerly views towards the City and London’s most famous landmarks. Superior guestrooms and suites feature far-reaching vistas over the vibrant areas of the south and towards the historic counties of Kent, Surrey and Sussex. Some of the most stunning views are from the hotel’s three signature suites that will be unveiled in September. All signature suites overlook St. Paul’s Cathedral, Tower Bridge and down river towards the O2 Arena. The jewel in the crown is the Shangri-La Suite, situated on level 39, providing 180-degree views of London. From the Palace of Westminster and Big Ben to the Tower of London, the view encompasses the River Thames with the Canary Wharf, Tate Modern, Shakespeare’s Globe Theatre and Maritime Greenwich dotted along the meandering waterway. The hotel will feature three wining and dining venues. GŎNG, London’s highest bar on level 52, takes its name from ‘dougong’ – an ancient Chinese structural element of interlocking wooden brackets that will be a component of the bar’s interior. TÎNG, derived from the Chinese word for a living room, is the signature restaurant and lounge on level 35 and LÁNG – the Chinese word for ‘pathway’ – is an artisan deli on the ground floor. Level 52 will also be home to a 24-hour gym and London’s highest infinity pool, and along with GŎNG, level 52 will duly open from July 1. Three river-facing event spaces on level 34 offer stunning views and state-of-the-art conferencing technology along with catering services. The largest of the venues, Ren, accommodates up to 140 guests; the other two, Yi and Li, can hold up to 10 and 35 guests, respectively. The grand staircase connecting levels 34 and 35, with its vista of St. Paul’s Cathedral and beyond, will be a picture-perfect location for wedding photography.